Sheridan has bulldozed his way to a place among the elite props in world rugby. At 6'5'' he is unusually tall for a prop, but his immense power has led to him demolishing even the stoutest of opponents. Sheridan won caps in the second row at England U16 and U18 level, before switching to prop on the advice of his coaches at Bristol. He toured with England to South Africa in 2000 and was a member of the Churchill Cup squad in 2003. Following his return from the tour he joined Sale Sharks after Bristol's relegation from the Premiership. Despite featuring for an England XV against the Barbarians in 2003, it was not until the autumn of 2004 that Sheridan won his first full England cap as a replacement against Canada. He was a controversial selection for the 2005 Lions tour, with only a single England cap to his name, but went on to make five midweek appearances while in New Zealand. It was against Australia in 2005 that Sheridan really established himself on the world stage, as he destroyed the Australian front row almost single-handed during their autumn international at Twickenham. Neither Australian prop finished the game, with Al Baxter sin-binned for repeatedly collapsing the scrum and Matt Dunning removed with a neck injury. Sheridan's reputation as a fearsome scrummager was born. He played every game of the 2006 Six Nations, but was sidelined for a long period of time following breaking his ankle in the 2006 autumn international against South Africa. He returned to the England side in time for the 2007 World Cup warm up tests against Wales and France, but was taken seriously ill and hospitalised following an insect bite whilst away with England in Marseille. Sheridan recovered in time for the World Cup itself, where he was able to produce displays as powerful as fans had come to expect. He was instrumental in crushing the Australian front row yet again in the quarter final and left the tournament as one of the outstanding forwards. He was selected for the British & Irish Lions tour of South Africa in 2009 but did not make selection for the first Test defeat in Durban. He came on as replacement for Gethin Jenkins in the second Test but once Adam Jones went off with a dislocated shoulder a minute later, the match went to uncontested scrums and limited Sheridan's impact. The Lions lost the match to a late Morne Steyn penalty but Sheridan started the next Test in a 28-9 consolation victory for the tourists. 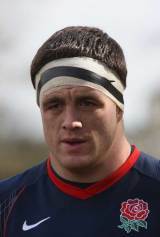 Sheridan suffered a severe shoulder dislocation in his club's Heineken Cup clash with Cardiff Blues back in October 2009 and he was sidelined until the eve of the 2010-11 season. A return to England colours followed for the end of year internationals before speculation linked him with a big-money move to France. But he eventually put pen to paper on a new one-year deal with Sale at the start of 2011 before injury again struck, this time a torn calf ruling him out of the end of England's Six Nations campaign. However, after making his comeback from the injury in the latter stages of the 2010-11 season, Sheridan found himself back in the England frame having been named in England's 30-man squad for the World Cup. But his comeback proved to be in vain. After playing one game for England at the start of the showpiece tournament against the Pumas, Sheridan had to return home after sustaining a shoulder injury. And back at Sale, Sheridan went into 2012 without having pulled on the Sharks shirt in the 2011-12 season. Come January, Sheridan was linked with a move to Toulon once again and on January 24, Sale boss Steve Diamond confirmed he would leave the team at the end of the season.